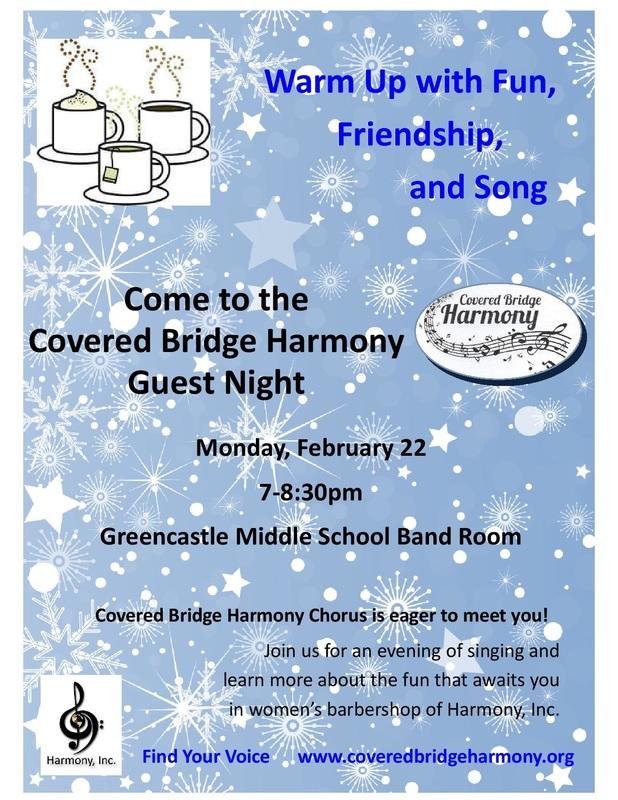 If you like to sing, you're invited to visit the Covered Bridge Harmony Chorus and FIND YOUR VOICE!! Coming to a Guest Night is the perfect way to find out more about us, and what we can do for you! You'll have the opportunity to meet us and sing along with us in four-part harmony. Then we'll take a break and enjoy some hot beverages. Stay a little longer and you can hear us perform four-part, a cappella harmony. Come back week after week and you'll be invited to join us on the risers to experience the music, friendship and fun for which the Covered Bridge Harmony Chorus is known! Women of all ages are invited to attend. For more information, contact Jodi at jeleach@iendeavor.com. If you're a woman who loves to sing, we'd love to meet you! Our members travel from all over our community to sing with the Covered Bridge Harmony Chorus. You'll come initially for the singing, but you'll return for the fun, friendship, and songs. Come check us out and find out for yourself!